Athletics at St. Mary Magdalene date back to the 1990s, but the ministry really took off in 2003 when it began offering youth basketball. Today, St. Mary Magdalene has 17 basketball teams, two softball teams and a Running Club. Over the years we've had many accomplishments, but no appropriate place to display our rich history. Without a gymnasium, trophies were stored in an office within the Parish Center. 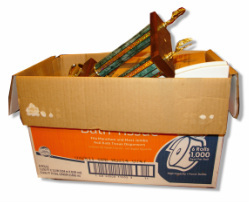 Unfortunately, with the shuffle of office space to accommodate the growth of our parish, our trophies were dismantled and placed in a cardboard box. As a vibrant, growing and active parish, it only seems appropriate that our church has a place to showcase its accomplishments – not just for athletics, but for other ministries as well. A new display case for our artifacts, plaques and trophies will serve as a lasting tribute to St. Mary Magdalene's past, current and future achievements. A trophy case seems especially appropriate in light of the 2011-12 success of our GDURMA Champion Junior Girls, and our Senior Girls and Junior Boys that placed second in their age groups. The Athletics Ministry seeks interested individuals to serve on a small committee to help assess cost, size, location, in-kind carpentry, and fundraising programs for a new lighted display case. Our goal is to understand our capabilities and establish our priorities by December 2012. Thank you for your interest in the Trophy Case Project and thank you in advance for your service.